Chewy peanut, almond and oat bar with dark chocolate pieces (10%) dipped in a chocolate flavoured coating. Made with real dark chocolate. Made with natural nuts. High in fibre. No artificial flavours, colours. No preservatives. Suitable for vegetarians. Kosher - D. Halal. Nature Valley Sweet & Salty Nut Cereal Bars are made with an indulgent blend of natural peanuts and wholegrain oats Nature Valley Sweet & Salty Nut Cereal Bars are the perfect high in fibre on the go snack for any time of day Why not also try Nature Valley Protein Peanut & Chocolate Cereal Bars or Nature Valley Nut Butter Peanut Biscuits? Who ever thought indulgence could come from a blend of natural peanuts, almonds and wholegrain oats? 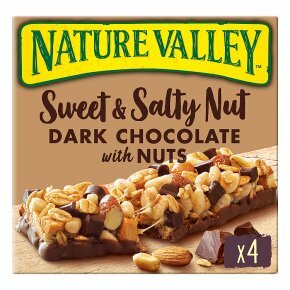 Made with luscious dark chocolate pieces, Nature Valley? Sweet & Salt Nut Dark Chocolate, Peanut & Almond bars will give you a delightfully sweet and salty sensation to make your next break exciting!